While Brazil’s president Jair Bolsonaro is trapped in a hospital bed with a health condition that may be more serious than apparently his doctors and family are willing to admit, his superminister of Justice Sergio Moro launched this week a “package” of measures to fight organized crime and corruption. The former judge is acting with absolute autonomy from the president, something that would be unthinkable in the administrations of Fernando Henrique Cardoso (1995-2002) or Luiz Inácio Lula da Silva (2003-2010). At the Belo Horizonte airport, from where I’m writing these lines, the TVs display Moro wielding an enlarged power on GloboNews channel to the middle class that is waiting for their flights. The punishment-oriented agenda of Operation Car Wash, which is used both to dismantle the political realm and persecute left-wing leaders and movements. Bolsonaro and his three sons spearhead the first one. The second one is commanded by Paulo Guedes. The third one is in Moro’s hands. The military are the mediators trying to bring some reason into the government. Globo [Brazil’s largest media conglomerate] is an ally pushing parts two and three of the agenda. It is, however, opposed to the first one (regarding morals and values). It seems that, as soon as the proposed pension reform is pushed through, Globo and the invisible powers of the so-called market will start off to try to topple or weaken the Bolsonaro family. The conservative restoration may then enter a new phase. To push parts two and three of the government’s tripod (neoliberalism and “Car Wash-ism”), Bolsonaro may become not only nonessential, but actually a dangerous weight, as his family becomes a liability after connections with Rio de Janeiro militia groups started to be exposed. You’d be wrong, however, if you think the conservative restoration will lose momentum because of this (already apparent) contradiction between the flat Earth society goons and the neoliberal/Car Warsh-ist sectors of the government. Moro’s aplomb (displayed for more than 2 hours on GloboNews as a moral hero) demonstrates that the restoration project is somehow autonomous from hard-line Bolsonarism. Conservatives have at least 3 wild cards up their sleeves to keep playing the game if Bolsonaro becomes weaker for medical or legal reasons: his vice president Hamilton Mourão, Moro, and São Paulo governor, João Doria. The first could carry on with the project, getting rid (as he have nodded) of the more backwards agenda regarding morals and values. Mourao would mean the return of a conservative military project, but with a laissez-faire aspect to it that the country’s military regime did not have under Geisel/Golbery. The other two are extremely strong cards that are preparing for the 2022 presidential election. Bolsonaro’s fortuitous debacle would not mean that the agenda of the government he currently runs (as a symbol more so than as an actual leader) would be defeated. On the contrary: Moro’s anti-crime package and the opportunistic declarations (by left and right lawmakers) made during the Senate president election (nodding at the “new politics”) show that the restoration agenda, which started with the 2013 uprising and gained momentum around the impeachment process against Dilma Rousseff and Operation Car Wash has enough drive to endure at least 8 years. What could change that, as I see it, is: the international geopolitical scenario (with the likely defeat of Trump’s ultra-right in the next US election) and the ability of the Brazilian Left to reorganize itself – more on the streets than on the Parliament. 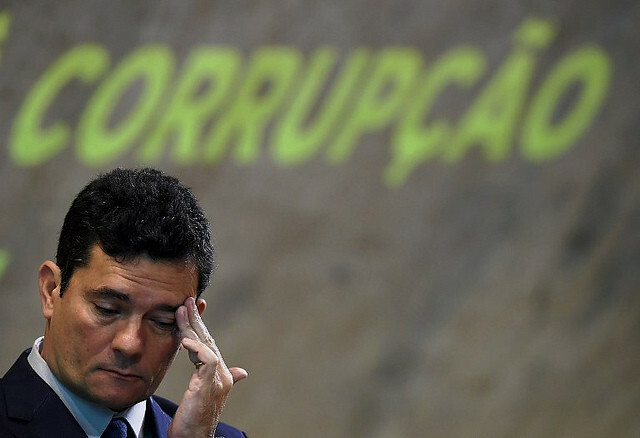 For the Right to consolidate itself in 2022, they will not only have to keep former president Luiz Inácio Lula da Silva in jail, but also push forward against people’s organizations and left-wing parties – and Moro’s package could have a decisive role in that operation.